Roxy is a character pack for DAZ's Aiko 3. You MUST own the full version of Aiko for this to work, as her distinctive look relies on the morph dials. This pack contains a morphed head and neck ONLY to change the character's appearance - no body morphs are included. She also comes with a full body texture, seven different eye colors, 7 different eye makeup options, and 7 different lips which can be applied separately if desired. She has been tested in all versions of Poser plus DAZ Studio, and should work fine in all of them. What beautiful work-- thank you. Thank you very much for this fine work. Chepi (8 years ago) Inappropriate? That Girl (9 years ago) Inappropriate? Romantikerin (9 years ago) Inappropriate? This is one of my favorite textures of Aiko. It's beautiful, thank you so much!!!! 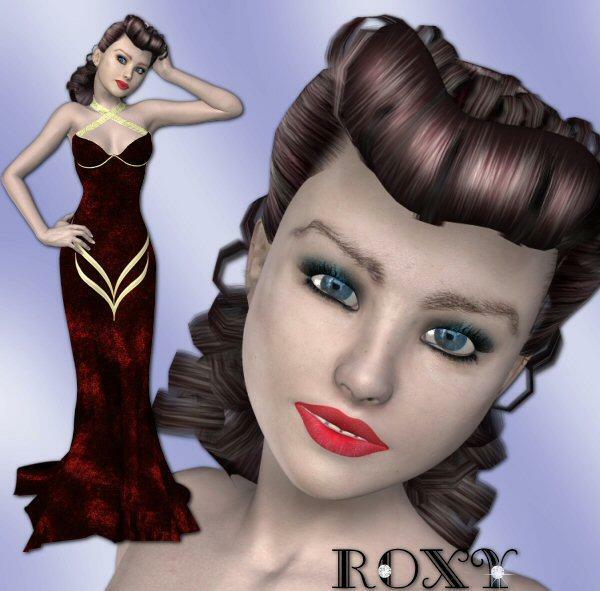 Ok one hair is Roz Hair, so what is the other hair called please ? It doesn't have a fit for A3, so you'll have to play with the dials and parent it, but it's a great look!